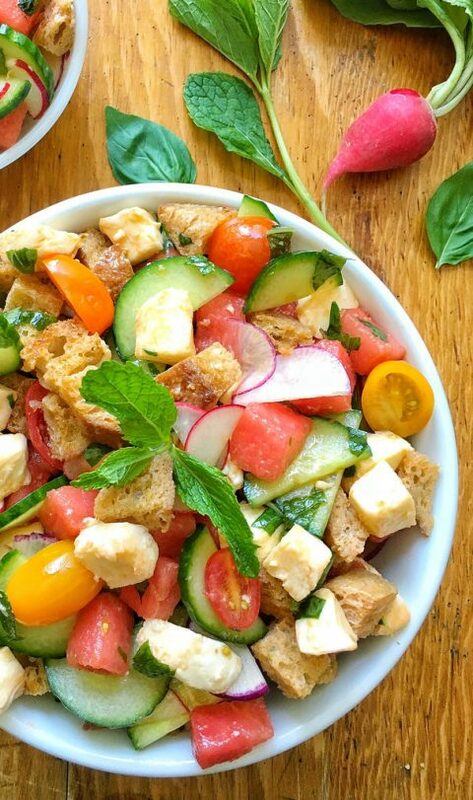 Classic panzanella salad is made with tomatoes and chunks of stale (or toasted) bread. Other components include onion and fresh basil. 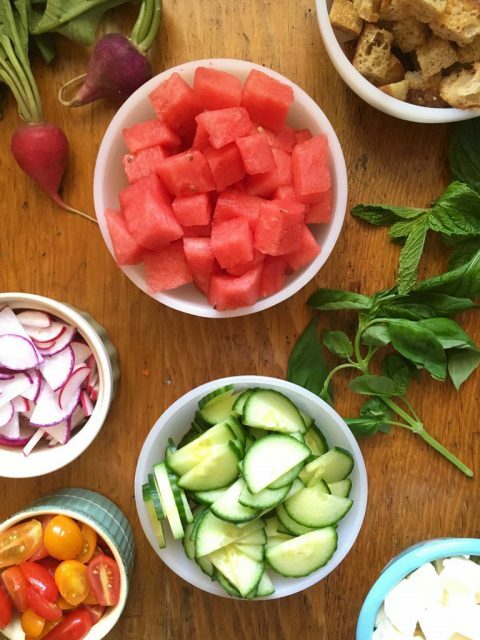 I gave this tasty Tuscan salad a new and even more nutritious fix by adding some extras including mozzarella cheese, paper-thin slices of English cucumber and radishes, juicy diced watermelon, and mint. I left the onions out since my kids don’t love ’em! Every month, I join other like-minded healthy food bloggers for The Recipe Redux cooking challenge. This month, we’re all celebrating ReDux’s 5th birthday by celebrating each other. For the challenge, I was asked to pick a fellow ReDuxer by going to their blog and either making one of their recipes or creating a recipe inspired by theirs. I chose a recipe for Portable Cherry Caprese Panzanella Salad, created by Deanna Segrave-Daly, RD. Deanna is a Philadelphia-based registered dietitian, food blogger, and co-founder of The Recipe Redux. She blogs with her dietitian partner, Serena Ball over at Teaspoon of Spice where you’ll find fast, healthy, family-pleasing recipes — the kind of food I like to make too. I discovered Deanna’s Portable Cherry Caprese Panzanella Salad when she featured it on one of her Facebook LIVE broadcasts. (If you haven’t seen any of Deanna’s Facebook LIVE broadcasts yet or her Healthy Kitchen Hacks, be sure to check them out.) I loved the panzanella-with-fruit idea so much that I decided to give classic panzanella salad my own unique spin by adding watermelon, cucumber, radishes, mint, and mozzarella. I’ve made this recipe two times in the past week, fed it to family and my interns (I have three nutrition students working with me right now! ), and I plan to make it over the July 4th weekend as well. This salad says summer to me. It’s juicy, crunchy, creamy, sweet, light, and refreshing. I served it as a main dish, but this salad could easily do double duty as a side dish. For me, the watermelon and mint really make this salad special. You could also add blackberries or raspberries. Red onion or thin slices of green onions would also work really well in the mix. Thanks for the inspiration Deanna! I don't like to heat up my kitchen in the summer, which is why I turn to salads like this one. Plus, salads can be super nutritious. 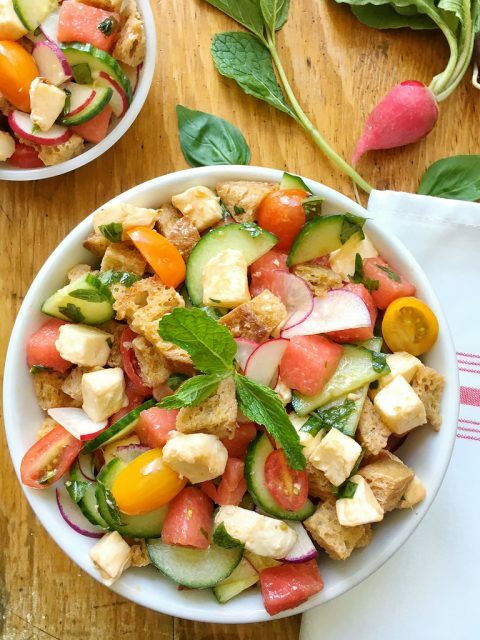 For my panzanella salad makeover, I use whole wheat bread versus white, add fresh mozzarella cheese for satisfying protein, and load up on the produce by going above and beyond the tomatoes, which you'd expect in a panzanella salad: English cucumber, radishes, watermelon, and mint. Place the bread cubes in a bowl, drizzle with 1 tablespoon of the oil, and stir until the bread is evenly coated with the oil. Arrange on a rimmed baking sheet, and bake for about 10 minutes, until toasted and crispy. Stir every 5 minutes. Remove and set aside to cool. Place the cooled bread cubes on a large platter or in a large bowl. Add the cheese, radishes, cucumber, tomatoes, watermelon, mint, and basil and stir gently to combine. Drizzle with the remaining 2 to 3 tablespoons of the oil and the balsamic vinegar to taste. Stir gently to combine. Season with kosher salt and black pepper. Check out all the other Recipe Redux creations this month! We we’re on the same wavelength this month for the Recipe Redux! 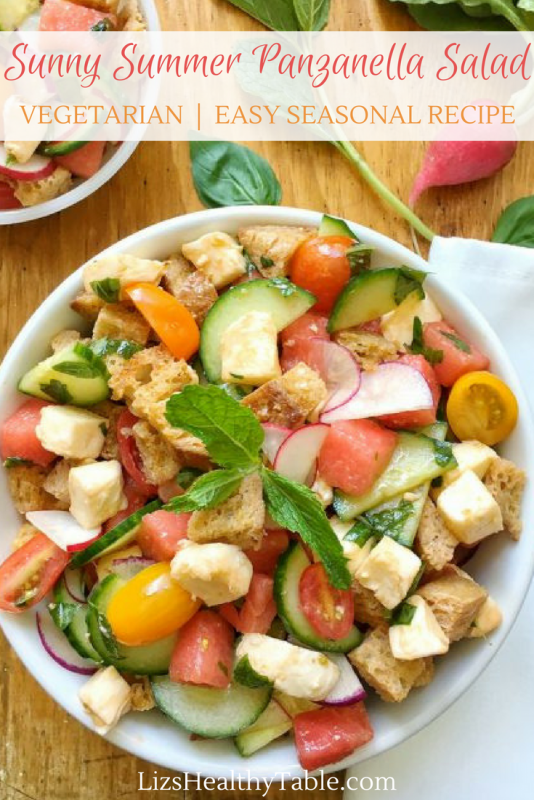 Love your Panzanella salad–especially the addition of watermelon & radishes. Awwww – thanks for all the shout-outs and love love your version of the caprese – it will be the next version I’ll try out! Happy summer Liz! Yum, this sounds and looks amazing! I can’t wait to try it! Thanks Lauren! Hope you enjoy. I loved your Redux post too. Perfect for summer. Made this salad yesterday and liked it. although it turned out quite watery and it was bland despite the vinaigrette and the mint & basil leaves. Looked beautiful, though. Next time I’ll make the salad in a sieve so that the excess liquid can drain off, and I’ll pep up the vinaigrette by adding Dijon mustard. I put in one clove of fresh garlic, which was not enough, so next time will put in two, plus pepper and salt. Also might add some garlic and/or Med herbs to the olive oil coating the bread.